A Maryland high school football team celebrated homecoming Friday on a new field, thanks to the Washington Redskins. 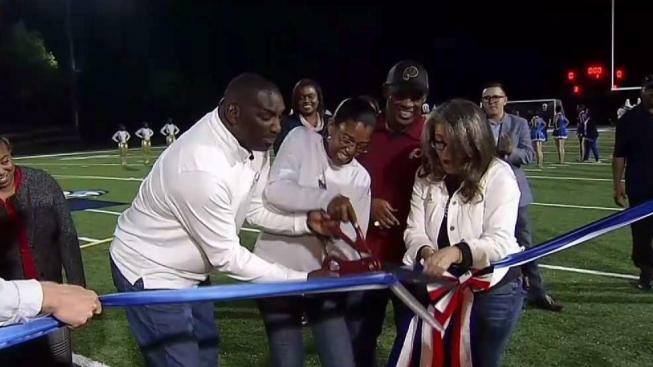 Redskins legends Doug Williams and Gary Clark attended the ribbon-cutting at Northwestern High School in Hyattsville Friday, unveiling a brand new synthetic turf field paid for by a $300,000 donation from the Washington Redskins Charitable Foundation. “To be here tonight, knowing that the Redskins had a hand in making some kids proud, the school, the county, and everyone proud, is a big thing,” Williams said. “It's unbelievable, just being able to come out,” Clark said. “It's been a struggle for us over the years,” head coach Bryan Pierre said about the old, muddy, overused field. Some players refused to play on it. “I sprained my Achilles and had to go to the hospital,” one said. The new field helps them run fast and cut, quickly changing directions without worrying about getting hurt.